Recently, Mopar’s maddest scientists have been making some absolutely bonkers cars like the 840 horsepower Dodge Challenger Demon and the 707 HP Jeep Grand Cherokee Trackhawk. What you may not know is that the SUV is technically faster than its more powerful muscle car cousin. How does that feel, Challenger bros? 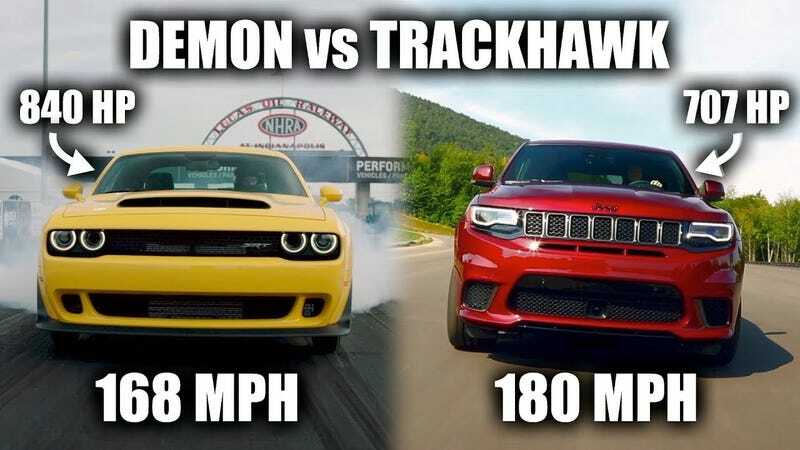 Our friend Jason Fenske at Engineering Explained breaks down why the Grand Cherokee Trackhawk can top out at 180 mph, which is absolutely insane for a Jeep, while the Demon can only reach a measly max velocity of 168 mph. Basically, it comes down to the tires. The Trackhawk has high speed rated performance rubber, while the Demon sacrifices top speed for the quickest possible quarter mile time. The Demon’s barely street legal drag compound needs to lay down the maximum amount of grip off the line and those tires are rated at a maximum speed of 168 mph, so Dodge electronically limits the Demon to that number. Fenske does point out that the 707 HP Hellcat Widebody can top out above 190 mph, which likely means the Demon could theoretically top out at around 200 mph with a different set of tires and its limiter removed. I guess some maniac is going to have to get the right set of tires and find a long runway to see how fast the Demon can really go. Please call us (and send us video) if you’re the maniac who decides to make that happen.